American attorney, author, lecturer, political activist, and candidate for President of the United States in five elections, including the last election 0f 2008, with his role in the 2000 election in particular being subject to much debate. 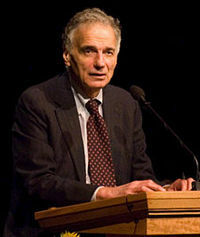 Areas of particular concern to Nader include consumer rights, humanitarianism, environmentalism, and democratic government. Nader is the first Arab American presidential candidate in the U.S.
Ralph Nader isn't a Goodreads Author (yet), but he does have a blog, so here are some recent posts imported from his feed. The famous anthropologist, Margaret Mead, once said to me that children have a distinct moral authority to change some of their parents’ habits or opinions. She gave use of seat belts and smoking cigarettes as examples. Who would you like to see win the 2016 United States presidential election? Is this you? Let us know. If not, help out and invite Ralph to Goodreads.